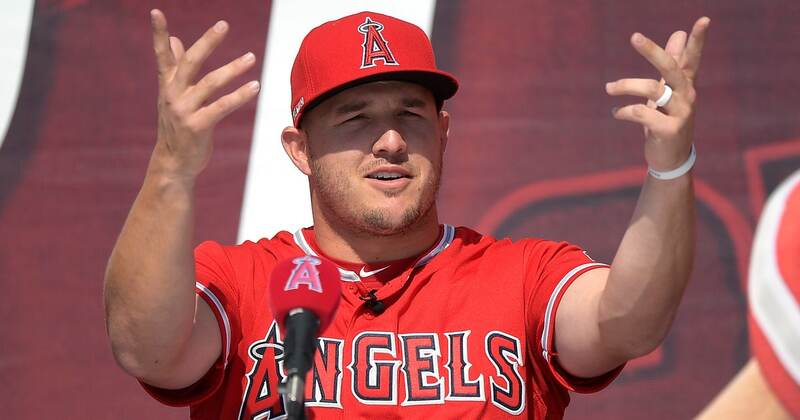 The crowd around the main entrance to Angel Stadium burst into raucous cheers, and so did Trout’s dozens of teammates and coaches in the audience below the podium. “I want to bring a championship back to Anaheim. Let’s go, baby!” Trout said. Eppler said the parameters of Trout’s long-term deal have been on his mind ever since he got the job in late 2015. The Angels have been talking about getting a deal done since 2017, and their talks with agent Craig Landis picked up last month when everyone decided a quick agreement could wipe out two years of uncertainty. Eppler was 100 miles outside Phoenix on a flight back to spring training last week when Landis texted him with confirmation that Trout would accept the Angels’ deal, saying he wanted to be “an Angel for life.” Unlike last winter, when he got the news that Shohei Ohtani had chosen the Angels, Eppler didn’t fall out of his chair this time. “I was wearing a seatbelt,” he said. Angels owner Arte Moreno had a one-hour, heart-to-heart conversation with Trout early in the negotiations. Moreno emerged with a measure of confidence that Trout was willing to tie his future to the franchise, even though the Angels have yet to win a playoff game during Trout’s career. The Angels also secured Trout’s commitment despite three consecutive losing seasons. Manager Brad Ausmus has taken over for Mike Scioscia, but the Angels made only a handful of moderately priced free-agent additions to their roster. But Moreno believes Trout’s commitment will help the Angels’ pursuit of teammates to help him in their World Series quest. With Moreno’s willingness to run a big budget and Eppler’s thorough revitalization of the farm system after years of neglect under the previous front office, the Angels likely are in their best position in years to achieve Trout’s dream of October success. What happens when a golf ball strikes another?